In 2010 Rule 160.1 in the IAAF Competition Rules was changed so that a kerb is no longer required on the straights of the running track, however, the strict rules concerning the requirements of a kerb on the bends remained unchanged, thus emphasizing the unwavering demand of a kerb in both bends of the track. 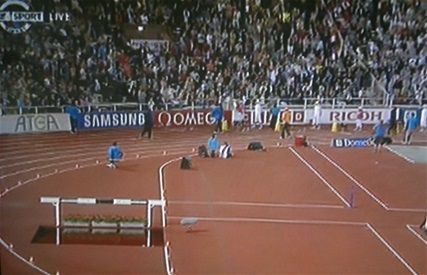 So much more astonishing is it that at the highest level of IAAF competitions, The Diamond League, the kerb is missing, as can be seen on the attached photo from Stockholm 2011. Accordingly all results from this event, achieved in races longer than 110m, should not be recognised officially and therefore be deleted. What has happened to the education and responsibility of the Technical Delegates and the ITO´s ? As for the above mentioned change it must be assumed that it has been preceeded by some serious considerations also including the unchanged part of Rule 160.1. However it appears that the considerations hasn´t gone beyound that, as there are no rules dealing with the situation where a runner is passing other runners by running inside on the grass along the straight. "On curves the situation is clear. Looking at Rules 163.3 and 163.4 we can see that going to the infield on a curve leads to disqualification (unless there was some pushing or things like that). But on the straight it is not forbidden, at least not in the rule text. Remember Bram Som in the 800m final in ECH 2006 in Göteborg! We should have a clear interpretation somewhere (because people keep on asking), but unfortunately we don’t have such. I agree that the possibility of removing the whole kerb and using only cones around the track should be discussed." So much for this, but for 2011 and henceforward the rule about the kerb on the bends must be abided by.